Fusing together jazz rock with whimsical, ironically charged lyrics and danceable grooves, Steely Dan took the 70s by storm! The funky duo have proven themselves as masters of live performance since their 1993 reunion & have become stalwarts of the stage! With rock-n-roll maestro Steve Winwood as support, fans are in for a night of incredible music – make sure to catch them all at Farm Bureau Live on Wednesday 13th July! From their critically acclaimed 1972 debut album Can't By a Thrill, to their triumph at the 2000 Grammys when Two Against Nature (their first studio album in 20 years) won four awards, Steely Dan have clearly earned their induction into the Rock and Roll Hall of Fame. The jazz rock band were hugely successful both critically and commercially in the 1970s and early 1980s before breaking up in 1981. They toured from 1972 to 1974 before retiring from live performances, becoming a studio-only band, and developing a cult following. 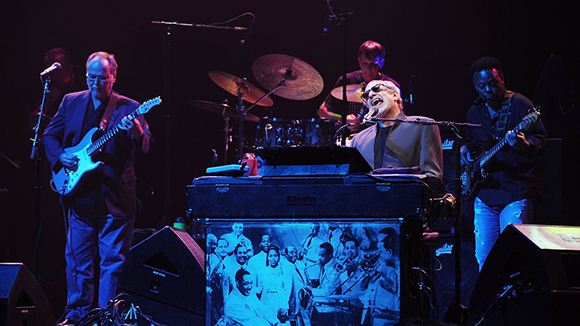 Since reuniting in 1993 Steely Dan has released two albums of new material, the first of which, Two Against Nature, earned a Grammy Award for Album of the Year. Steely Dan have sold more than 40 million albums worldwide and were inducted into the Rock and Roll Hall of Fame in March 2001, as well as reaching #82 in VH1's list of the 100 Greatest Artists of All Time.